Walberg and Auge is back is now registered as a non-profit Historical Preservation Drum Company/Corporation for historical and educational purposes. • Preserve and restore the historical significance and musical instruments of America's most and unknown drum and musical instrument company... W&A. • Develop/Publish the Walberg and Auge book that documents the past and future of W&A. • Continue the tradition of designing and building Walberg and Auge drum sets and snare drums with the details and perfection-level craftsmanship of W&A drums built from yesteryear. Walberg and Auge was responsible for inventing and manufacturing the high hat stand, cowbell holder, triangle holder, cymbal stand with rubber feet, tom holder, drum throne, clamping basket snare stand (Buck Rogers snare stand), first telescopic wire brushes, first folding bass drum pedal and much more! 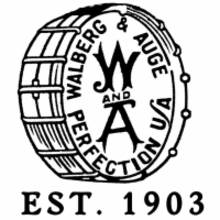 It could be said that every American manufactured drum set from the 1920's - 1960's has and/or had a piece of Walberg and Auge hardware on the drum set. It also could be said that Walberg and Auge invented the 'modern drum set' as we know it today. W&A also custom made high quality snare drums and drum sets, mostly using Gretsch shells with a variety of Gretsch, Rogers, Ludwig hoops and lugs they received from hardware trade/barters. Robert George Bernard, (RGB) was the craftsman that handmade Walberg and Auge drum from the late 1950's until the closing of the factory in 1978. His initials and build date can be found inside each drum he made. RGB learned his craft from his father, George Bernard. George started working for W&A in 1905. He hand crafted drums and other band instruments until the mid 1950's. His drums were usually painted black on the inside of each drum shell. Essentially, two generations of the 'Bernard family' were the key craftsman of Walberg and Auge drums. Today, this tradition continues with drum craftsman/artisan... Rob Kampa. (of Magstar Custom Drums) Mr. Kampa brings decades of experience and wisdom to W&A by building drums which stay true to the 'Perfection' standards and philosophy of Walberg and Auge of yesteryear.